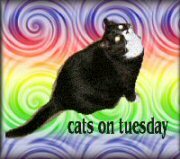 The Catland Chronicles: Cats on Tuesday. Flat Cat Still Doesn't Have a Blog. Cats on Tuesday. Flat Cat Still Doesn't Have a Blog. The lady who lives with us STILL won't give me a blog. She says it will never, ever happen. I thought my internet fans would, like, start a letter writing campaign but nobody even cares! All the blogging cats who are already famous just care about themselves like the show business cats in that song the lady plays all the time: "Show Business Cats" by "Steely Dan." She dances around the room to it when nobody else is home, which is how the lamp got broken (she tried to blame it on the Cats, but I don't think the man who lives with us believed her). We all like it when she dances because she can't, like, keep her balance at all! And she sings along with the music which is also hilarious! Those blogging cats all know that if I had my own blog I would become the most famous cat of all and win all the blogging prizes and awards. If I were in the Acatemy Awards I bet EVERYONE would vote for me. But do you think the lady and man will let ME be in a movie? Ha ha if you said "yes." She won't even let me have my own blog! The lady made a button with a picture of me on it because I guess she feels guilty. I hope she feels guilty. She is always making fun of me and calling me, like, "Chubby Boots" and "Little Shamu." Also she has a cold and is always coughing and then laughing when I run away, so then she has to cough some more! I HATE that sound she makes and I tell her so. And whenever I do, she and the man both laugh and laugh and then they pretend to IMITATE me. "Meep meeep meeep meep!" is what the lady says to make fun of me, which is just GIBBERISH. And she does it in a little high-pitched voice like a mouse because besides calling me fat, everyone around here makes fun of my VOICE. Yesterday, I was in the kitchen trying to eat and she coughed, so I, like, stuck my head around the door and asked her if she could please STOP. She started laughing so hard she kicked over a little table and salsa and blue corn chips went everywhere and the man got mad at her. HA!